Small interfering RNA (top left), dicer (top right), and argonaute (bottom). Double-stranded RNA is often a sign of trouble. Our transfer RNA and ribosomes do contain little hairpins that are double-stranded, but most of the free forms of RNA, messenger RNA molecules in particular, are single strands. Many viruses, however, form long stretches of double-stranded RNA as they replicate their genomes. When our cells find double-stranded RNA, it is often a sign of an infection, and they mount a vigorous response that often leads to death of the entire cell. However, plant and animal cells also have a more targeted defense that attacks the viral RNA directly, termed RNA interference. RNA interference starts with a long double-stranded RNA, such as the ones formed as viruses replicate. 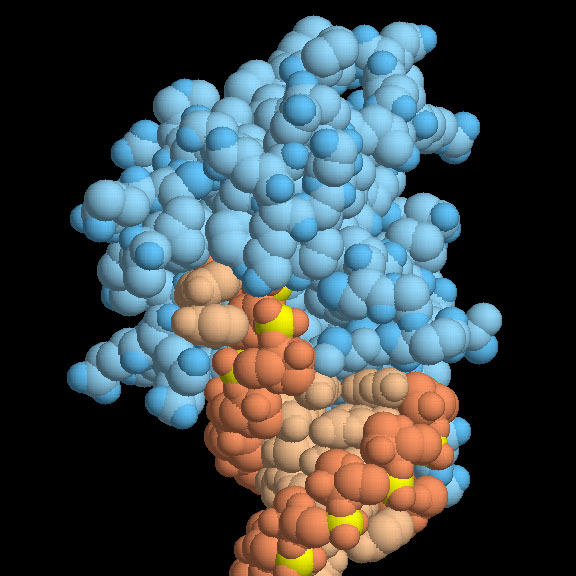 The protein dicer, shown here at the top in blue from PDB entry 2ffl , cuts this RNA into small, distinctive pieces called small interfering RNA (siRNA), shown on the left from PDB entry 2f8s . Each siRNA is about 21 base pairs long and has a distinctive overhang of two base pairs on each strand, and a left-over phosphate at the other end of each strand. This makes them easy to recognize. In the dicer protein, notice how the four manganese ions (in magenta) are arranged. They are thought to make two offset cuts in the RNA double helix, forming the overhang. In the years since the discovery of RNA interference, researchers have found that this process is far more widespread than we might expect, and that small pieces of RNA play many functional roles. A similar class of molecules, termed microRNA, are created in the nucleus from the normal RNA of the cell. These are also processed by dicer and are used to modulate the use of our normal messenger RNA, by pairing with the RNA and blocking its use. They also find complementary sequences in the DNA genome, modifying the properties of the chromosomes by changing the levels of methylation or histone binding. Plant and animal cells are prepackaged with this machinery for destroying specific RNA strands, and scientists have taken full advantage of it. It is now possible to synthesize a non-natural interfering RNA, then insert it into a cell and destroy any messenger RNA that we desire. This is a fast and easy way to determine the function of a gene: you destroy most of the messenger RNA using a custom interfering RNA, thus slowing production of the protein, and see what goes wrong. Medical researchers are also trying to use these small RNA molecules to fight disease, for instance, using them to knock out cancer genes. Viral suppressor protein p19 bound to siRNA. Viruses are tricky and rarely sit still when they are being attacked. They have found ways to fight back against RNA interference. The protein shown here (PDB entry 1r9f ) is a suppressor protein made by tomato bushy stunt virus. It binds to siRNA and blocks its use for destruction of viral messenger RNA. Notice how the protein (in blue) acts like a ruler, stacking on each end of the siRNA (in orange and red). In this way, it seeks out and blocks only small pieces of RNA that are the right length to be siRNA. The siRNA molecules made by dicer are easy to recognize: they are a uniform length, and they have an unusual overhang of bases at each end. The structure shown in blue here, from PDB entry 1si3 , is the "PAZ" domain used by many proteins to recognize the ends of siRNA (a small piece of an siRNA is shown in orange). 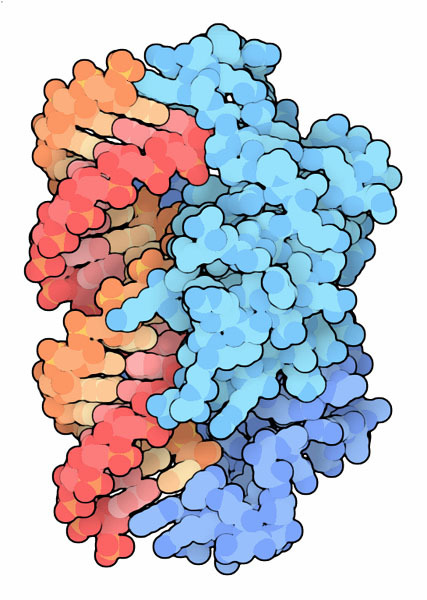 Notice how the overhanging bases bind into a small pocket, and the exposed base at the end of the shorter strand is covered by a little shelf of protein. To explore this structure in more detail, click on the image for an interactive JSmol. L. Peters and G. Meister (2007) Argonaute proteins: mediators of RNA silencing. Molecular Cell 26, 611-623. L. Aagaard and J. L. Rossi (2007) RNAi therapeutics: principles, prospects and challenges. Advanced Drug Delivery Reviews 59, 75-86. D. J. Patel, J. B. Ma, Y. R. Yan, K. Ye, Y. Pei, V. Kuryavyi, L. Malinina, G. Meister and T. Tuschl (2006) Structure biology of RNA silencing and its functional implications. Cold Spring Harbor Symposia on Quantitative Biology 71, 81-93.